I like to fight the good fight. When I feel I am doing my best to protect my kids, it makes me feel like I am doing something right and the best I can do. I am a mama bear for sure. This also means protecting them from toxic chemicals that are in the very things that are designed for children and sold to unsuspecting parents who think they are only doing good by bathing their children in an awesomely scented baby wash. When unbeknownst to them, that baby wash can actually be harmful. Not too long ago, I remember reading about all the chemicals that are in those washes. Several of the ingredients are classified as potentially harmful or toxic to organs and can cause skin irritations and allergic reactions. That’s why I wanted to make my own natural, non-toxic, baby wash. If you don’t have the Think Dirty App for your phone, I encourage you to download it and start scanning the products in your home. You will probably be pretty surprised with the results! These are on a scale of 0-10, with 10 being the worst for you… look at these baby products. Don’t get me wrong, they are not necessarily horrendous for your child, otherwise they wouldn’t be allowed, right (let’s hope)? But there is definitely a better option out there. I’m sure you know where I’m going with this. Make your own. Then you know exactly what is in it. You will know with 100% confidence you are only using the very best ingredients on your baby’s delicate skin. Your skin is your largest organ and you need to be careful how you treat it. 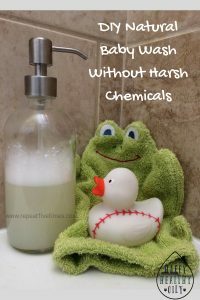 Did you know those harsh chemicals baby washes can soak into your baby’s skin and get into his/her bloodstream? Please, make sure you are only using the best ingredients. I want to help you out because I feel it’s not only important but is super easy and believe it or not cheaper than the stuff you buy that can have potentially harmful chemicals in them. The ingredients I linked to are larger size than necessary, but I make things for 5 kids at once so I like to buy larger sizes which are cheaper in the long run. Feel free to purchase smaller sizes, or go ahead and purchase the larger ones and you will have them on hand when needed. When averaged out per oz, this baby wash comes in cheaper than many of the natural and/or organic ones that are available.